Life has been throwing sour grapes at me lately and this morning I decided to take the bull by the horns. I took a drive. In my 19 and 95 Ford pickup. Down the country roads. Windows down. Music up. After getting some nutrition (cheetos and Dr. Pepper), I hit the back roads for some garage saling. I found this chick pretty early on. She and her chick sisters made me smile out loud. They happen to dance in the wind, dodging sour grapes as they boogie. And then? I found it. The chair. Ahhhhh, this chair. Listen here. I let the chicks sit in it for a picture, but they had to shove me off the throne first. I am loving this chair! I have a thing for stuffing. It's just a sign of life, to me. Life that's been here. Life that has lived on and around this seat of mystery. Life with sour grapes and all. One of my girlfriends asked me to give a story about the chair. But, y'all are creative! Y'all make up a story about the life and times of this chair and leave it in the comments, k? Oh! I'll give you the known, and you go from there. This is going to be fun! Per the nice man at the garage sale, this chair came from a 90+ year old house in Greenville, Texas. He and his wife are real estate flippers and they rescued the chair from one of the upstairs rooms of the old house. Happy Weekend and Happy Now, my friends! Love the chicks! 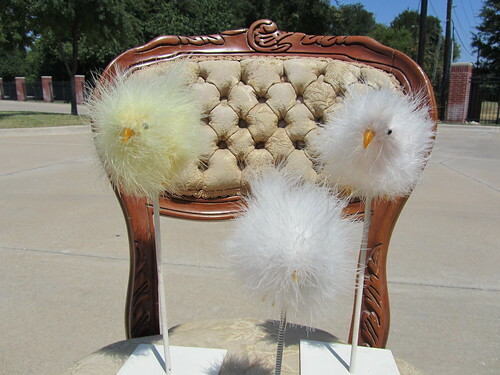 Fluffy little fellows! Oh no! I accidentally hit reject! Look! She had a great story! Sorry Debra! I live in Royse City so I am glad to hear about the new place u will be moving in. I love those back road drives also. I always take my camera in case there is a photo waiting to happen. I have a booth in caddo Mills. "Shabby Junk". It's in the old Payne Furniture store "SIMPLY HEAVEN". I have a room with a front window on the corner of the bldg. See ya when u open! Oh girl, I just did 12+ hours in the coal mines today, so my creative juices are completely dry....no stories from me, just a whole lotta admiration and lusting after that swoony chair! That pretty chair was waiting for somebody with a visionary heart to come and rescue her. The visionary heart felt the connection and Alas! The pretty chair found a home. The pretty chair biggest desire, to be loved just as she is. I do!. Blessings, Marta. This chair belonged to the mother of three little boys who were very rowdy. She sent them to sit in the chair that was placed in the corner for time out. Since her sons were so full of mischeif, it got lots of use!! Love this post! I don't think I could come up with a story about the chair that could match yours, though! Love the chair, Mindy!! 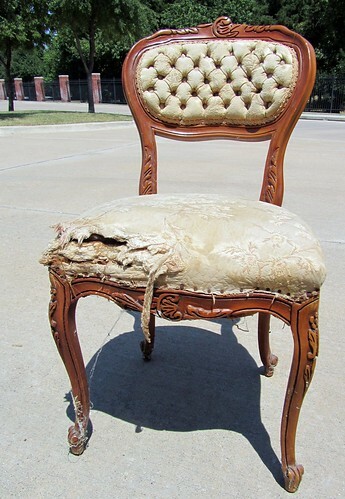 Anything with torn and tattered old fabric and tufting makes my heart pitter-patter...!!! throwing you some love girl and prayers. No more sour grapes for you:(( Love the chair and the chicks. That was the chair that somehow ended up in the Comfort Suites in Rowlett Texas. When I found out Ms. TNT Debbie was driving all the way across town and I was finally going to meet her I was sitting in that chair and shot out of it so fast I tore the stuffing right out! 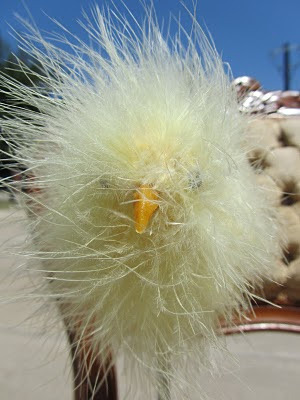 I even layed a few eggs, thus the frizzy chicks. Now my next goal is to meet you. Who knows what I will be sitting on then. Tee hee! Great find, and here's to all your sour grapes turning to Champagne! "I have seen births, deaths, proms, weddings, debutantes, happiness, love and sadness. I have been loved by people who have sat on the edge of their seats. I have helped new kittens trim their claws and caught the drool from new little ones teething on my cool wood trim. I think I'm beautiful the way I am"